Whenever you print a document, that document enters a print queue, a line of documents waiting for their turn at the printer. A printer icon appears in your system tray next to the clock to let you know that the queue is active. You can open the print queue and do some document management. To open the print queue, double-click the printer icon in the system tray when it appears. The print queue shows a list of documents waiting to print in the order in which they are to be printed. For each document, details such as owner, number of pages, document size, and time of submission are also shown. To remove a document from the print queue—that is, to stop it from being printed—right-click the document and choose Cancel from the context menu. Be sure that you choose the correct document because Windows does not ask whether you are sure that you want to remove the document. You can pause a document, in which case it remains in the print queue but does not print until you choose to resume printing. Other documents waiting in the queue continue to print. To pause a document, right-click the document and choose Pause from the context menu; the status of the document in the print queue window changes to Paused. Right-click on the document and choose Resume from the context menu when you are ready for the document to continue printing. You can also restart a document so that it prints from the beginning. When you resume a paused document, it begins printing again from the point where it left off when it was paused. 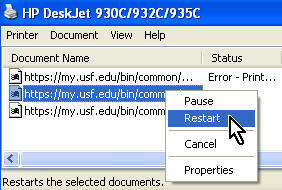 However, you can also restart a paused print job so that it begins printing from the beginning of the document. This can be useful if, for example, you start to print a document and then realize the wrong paper is loaded in the printer. 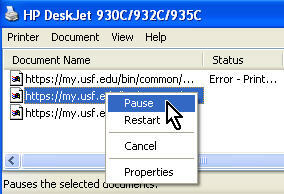 You can pause the document, change the paper, and then restart the document. 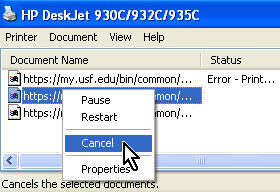 To restart a document, right-click the document and choose Restart from the context menu. Managing documents on a printer that is available over the network works the same way, but you can only perform the actions listed above on documents you have sent to that printer (in other words documents owned by you).